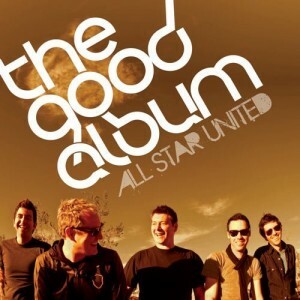 All Star United – The Good Album | NoCoda. What It Sounds Like: Without a doubt, the most fun, electric, alternative rock and pop album of its release date year. Goodness, I love when an album comes charging out through the gate and knocks you flat. Ian Eskelin and his crew have always been a major player in the “Christian Rock” circuit for me, penning big, driving guitar alternative-pop-rock songs with superior choruses that stray from the stereotypical “overly safe” stuff we may come to find on a radio station that may be called something like…”The Fish”. Their 1997 self titled release, along with 1998’s International Anthems For The Human Race were both fantastic, though 2002’s Revolution had a few winners, but ultimately was a huge letdown for a band that had such a promising start. Still, it makes no sense, and I have no excuse, for it taking me this long to pick up their latest release from 2009/2010, The Good Album. I’m sure Revolution simply left a bad taste in my mouth, and with as much music as I buy, it just got pushed to the bottom portion of the priority list. Shame on me – lesson learned. I had no idea what I had been missing out on the past couple of years. The joke has probably been made a million times, but this record is anything but “the good album” – it’s the freaking great album! I almost (almost! it’s such a tough call) want to say that this is their best work to date. It’s a powerhouse of a record that doesn’t have one filler track the whole way though, and its chocked full of driving guitar anthems and sing along choruses, while the heat from the sun just shines down and coats us with its warmth and (there’s no better word for it) – happiness! This is a positive and great time summer record, no doubt about it. It’s no accident that this thing was first released in the heat-soaked months (July in the UK, August in the USA). This is all coming from a band that wrote a song called Theme From Summer about fifteen years ago – we know what they like. Only one song breaks the four minute barrier, while all the others stay in the mid-twos to mid-threes. It’s a success for these bursts of rock and roll – the ideas are presented, you sing the chorus a couple times with some variation, and then you move on to the next one. They’re all unique, and it shows once and for all Ian’s abilities and why he’s an award winning producer and writer. The dude can write a pop song, no question. The Good Album is the opposite of a band trying any sort of experimentation. I’m just a sucker for fast, upbeat rock songs. Crashing Cars is fun overload. Lights Out slays with Ian proclaiming to his girl You can thank me later, but babe, you’re gonna hate me now…! Sometimes you gotta think for people who can’t think for themselves – clarity clarity! Lyrically, you certainly could make the case that there is a lack of “depth” on this record. It’s a lot of fun stuff – songs like Good Luck With The Girls, and the witty tale of the guy who never figured out how to grow up on Dude…That’s Freaking Awesome! (sample lines: Freshman girls are into you / Til you drink so much you puke on your shoes / Dude…that’s freaking awesome! / You quit your job so you could play / Word of Warcraft every day / Dude…that’s freaking awesome!) can only go so far if you want to look into maturity. However, this record wasn’t made to tackle the big issues. It highly succeeds in what it set out to do – have a good stinkin’ time. But even making a “good times” record doesn’t mean you have to talk about pointless things the whole time. The lyrics overall, while they aren’t especially deep, are far from sounding reaching, overdone, or stupid. Closing the album are Good Times and Beautiful Way, which certainly show lyrical prowess. A huge A+ to All Star United for this release. I’m finding incredibly few faults. It doesn’t have the nostalgia effect of their early releases (obviously), but the fun and powerful riffs / songwriting and here in full effect. This album is way more than “good”. Tony the Tiger would certainly agree. It’s a must own for any ASU fan, or power pop fan in general.